We all know how this particular story is going to turn out. Even people who know nothing about Neil Armstong will at the very least know about the now infamous “one small step for man” line, because it is such an iconic piece of history that you’d be hard-pressed to find a single soul who actually knows what it’s referring to when someone quotes it. That just makes the accomplishments of Damien Chazelle’s First Man all the more greater, because while you know exactly how it will all end, the journey towards getting to that point is depicted with such seat-clutching tension and incredibly nuanced emotion that you’re cheering all the more for that inevitable conclusion when it arrives, especially after witnessing the sometimes horrific trials and tribulations that brought everyone to that point. This is a pretty amazing film, not only for its docu-style depiction of NASA’s decade-long mission to land a man on the moon, but also for an intriguing and effective character study of a man who went through some serious hurdles during his life but just became more determined than ever as a result of all of them. In other words, 33-year-old Chazelle is, and should be, the envy of most Hollywood directors right now, having now made three fantastic movies in a row before he’s even begun his mid-life crisis, whereas most other filmmakers his age would struggle to get their first project off the ground. With Whiplash, he made his own version of a horror movie; with La La Land, he brought back the energy and sophistication of the old-fashioned Hollywood musical; and with First Man, he’s made a way better companion piece to Stanley Kubrick’s 2001: A Space Odyssey than Christopher Nolan did with Interstellar, if only because this film at least looks and feels like something which would have been made back when Kubrick made his movie. I’d like to imagine that Nolan is currently sitting in an armchair backing a glass of whiskey whilst intensely staring at a picture of Chazelle on his wall before hurling the glass directly at it, because Chazelle somehow managed to make a more emotional and compelling piece of sci-fi than he did, and unlike Nolan’s picture this one is easily going to end up on my Best of 2018 list, for many, many reasons. 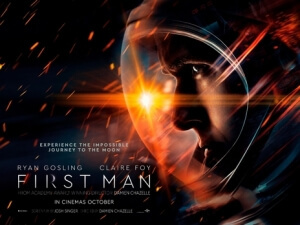 Like I said, this story is one that everyone knows the outcome of, but the film takes us on a decade-long journey leading up to that infamous moon mission, starting with Armstrong (Ryan Gosling) and his wife Janet (Claire Foy) mourning the loss of their infant daughter Karen to a brain tumour. It’s a traumatic incident for any parent, and Armstrong is no exception, though he doesn’t take long to shove that emotional blow aside and just get on with the work, landing a spot on NASA’s coveted Gemini program and spending the next few years developing and fronting missions up into the stratosphere, before eventually fronting their 1969 Apollo 11 mission, but not before enduring one loss after another in the process. This movie really doesn’t shy away from the fact that while the Apollo 11 mission was a resounding success, so many astronauts and engineers lost their lives when prototype pods malfunctioned and/or crashed, many of them people that Armstrong becomes close friends with over the years. Because the film had taken a decent amount of time setting up these fatal characters as actual people, their sudden loss is made all the more painful for the audience, least of all Armstrong himself. But in his case, because he had endured such a harrowing tragedy so early on in the film, he finds that he must put on a calm and collected face to carry his way through their growing deaths, to a point to where he soon becomes so emotionally detached from his wife and even his own surviving children that he speaks to them as though he were robotically giving answers at a press conference. In many respects, this makes the character seem quite cold and even sociopathic on paper, but Gosling gives such a haunting and mesmerising performance that allows him to bring humanity to someone who could so easily have been just a stoic wet blanket of a man in the hands of a lesser actor, that by the end you’re just as on the verge of tears as he is when he finally reaches his ultimate goal. Claire Foy also knocks it out of the park and straight into the stratosphere with a commanding and emotionally raw piece of acting that is bound to get her a lot of love this coming awards season, along with Gosling who at the very least deserves a nomination for his own outstanding work here. The real star here, though, is the sheer aesthetic that Chazelle creates for this movie, especially in each and every scene that sees either Armstrong or other astronauts make their numerous trips up to the edge of our planet. The sound design in these scenes deserves each and every sound award it can get, because the way it is meticulously crafted – from the slight creaks in the pod’s metal to the shuddering vibrations in each and every screw – makes every second harrowing, because you’re anticipating that at any given moment it could all go horribly, horribly wrong (even though you know it won’t in the end). The editing and camerawork, the latter by Chazelle’s previous Oscar-winning cinematographer Linus Sandgren, gives the film a grainy and shaky style that really lands you right there in the middle of the scene, leaving you to experience moments that are far scarier than most horror films I’ve seen all year. It’s up there with Gravity in regards to how it treats space almost like a deranged serial killer, causing all sorts of scary things to happen before hopefully claiming a victim; but if that’s the case, then Armstrong is arguably the film’s “final girl” who overcomes the murderous threat and gets out with his life fully intact. That, of course, leads into the film’s climactic recreation of the moon landing itself, which looks and feels as though the myth that Stanley Kubrick really did stage everything was indeed true, because here it all looks so eerily real and exactly like something the great director would have made back in the day. The whole sequence, which you really need to see in IMAX, is an astonishing highlight in an already astonishing film, for its simple beauty but also one hell of an emotional payoff that damn well nearly had me choked up, and just goes to show that all the horror that Armstrong and NASA had to go through beforehand was worth it in the end, just as First Man was indeed worth sitting through some of the most intense, but also best, scenes of the year. First Man is an astonishing accomplishment that sees Damien Chazelle recreate the terrifying years leading up to the infamous 1969 mission to the moon with outstanding aesthetic and powerful emotion, anchored by an excellent Ryan Gosling as Neil Armstrong as well as an equally magnificent Claire Foy as his Earth-bound wife.